I made a delicious savory Hot Potato Salad recipe using SPLENDA® Sweeteners as part of a sponsored post for Socialstars #SplendaSweeties #SweetSwaps. All opinions are my own. This Hot Potato Salad has so many flavors- sweet, sour, salty- but is super easy to make. It makes a delicious side for just about any meal and is great for pot lucks. Plus, it is so filling and tasty I sometimes find myself eating a bowl of it for lunch. I spend a good part of December baking sweets and by the end of the month I am on sugar overload. To tell you the truth, I usually don’t wait until New Years to start my resolutions. On December 26th, I do a sweep to get rid of all the sweets. I actually start to crave more savory foods like this Hot Potato Salad. It has a little sweetness to it, but the sweetness is balanced by other flavors. Some apple cider vinegar adds a little sour to the sweetness and bacon provides plenty of saltiness. 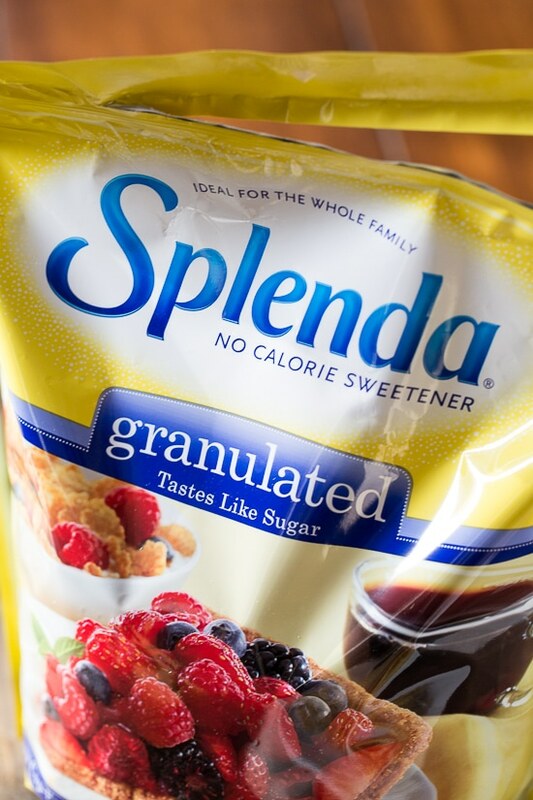 As we head into the New Year, learn more about SPLENDA® Sweeteners and how you can make #sweetswaps. The Sweet Swaps program is dishing out hundreds of ways to save calories by swapping full sugar for SPLENDA® Sweeteners. 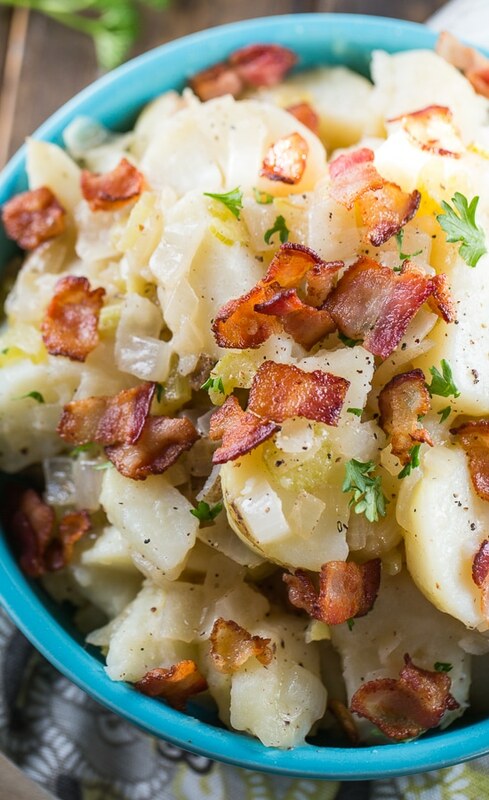 I love the way onion, celery, and bacon flavor the potatoes in this recipe, but I know a lot of people aren’t a fan of celery. If that is you, just leave it out. Green olives would make a great addition to Hot Potato Salad for some extra savory flavor. Hot Potato Salad has plenty of sweet, sour, and salty flavor and makes a wonderful side for any meal. Place potatoes in a Dutch oven or large pot and cover with water. (Do not peel them.) Bring water to a boil, reduce heat to maintain a simmer and boil 20 minutes, or until just tender all the way through. Drain potatoes, let cool, and peel skin off. Slice potatoes into bite-sized pieces. Dice bacon and place into a nonstick skillet. Cook over medium-heat until crisp. Using a slotted spoon, remove bacon to a paper towel-lined plate. Discard all but about 2 tablespoons bacon fat. Add onion and celery to bacon fat and cook until soft. While onion is cooking, combine vinegar, SPLENDA® Sweetener, chicken broth, salt, mustard, and pepper in a small bowl. Once onion and celery are softened, sprinkle flour over them and cook 1 minute. Stir in chicken broth mixture and cook for 1 minute. Add potatoes to pan and stir to mix everything together. Check for seasoning and add more salt and pepper if needed. Sprinkle with bacon and parsley just before serving. Best served warm or at room temperature. I like to boil the potatoes with the skins on and then peel them after they are cooked. I think this helps prevent the potatoes from becoming waterlogged. If your potatoes are small, you can cook them whole. Add more cider vinegar or more SPLENDA® Sweetener to create the right balance of sweet and sour to suit your personal taste. This entry was posted in Side Dishes and tagged bacon, potatoes, Splenda®. Bookmark the permalink. Love this lower sugar version! Such a good idea! I’ve never had a hot potato salad before but it is a perfect way to take my favorite side into winter! Great idea with the splenda too! 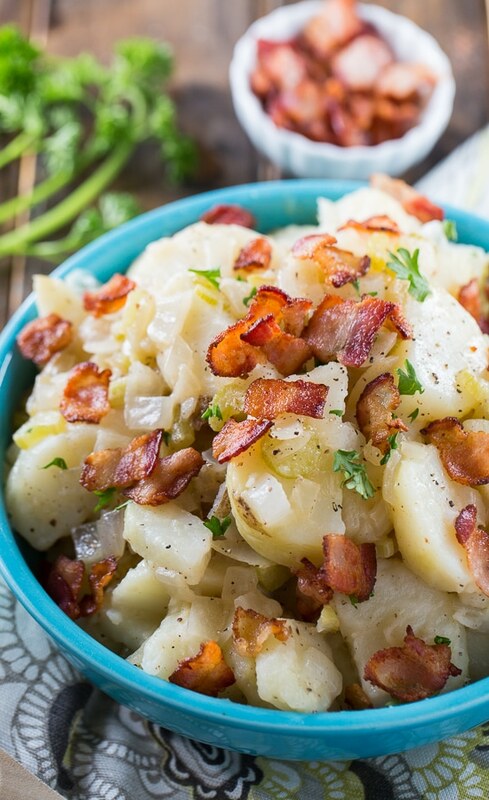 I love this hot potato salad – it looks perfect with all that crisp bacon. This seriously, look perfect! I’m totally hungry for potato salad now! 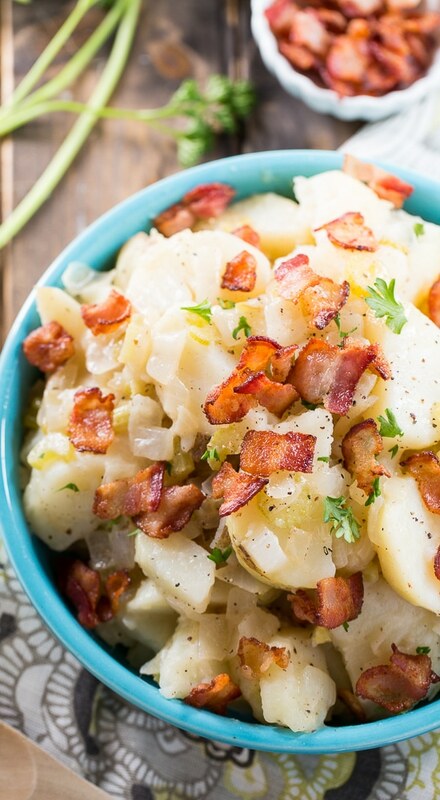 I have been around way too much sugar lately and this potato salad is just what I need! Love it! Hope you and your family have a wonderful holiday! 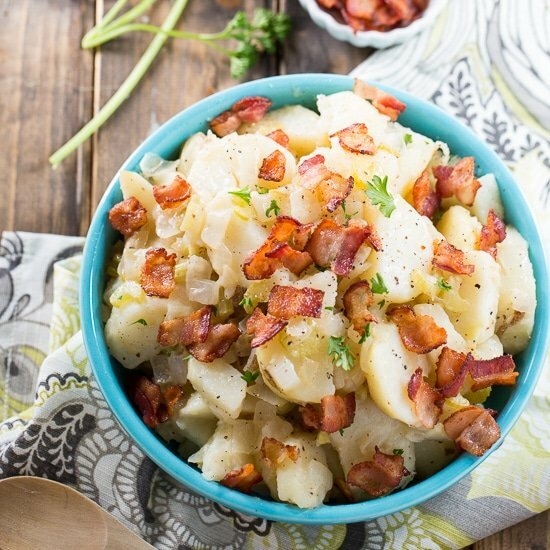 This hot potato salad looks so delicious! Love the bacon, so much flavour and deliciousness! Definitely gotta try this soon! Thanks for sharing and happy holidays! This hot pototo salad looks absolutely delicious! Love all of the bacon in there too. Bacon makes every dish that much better! I love hot potato salad! I mean, bacon. And all of those other good things. Looks amazing! haha I’m already on a bit of a sugar overload and craving lots of veggies and savory foods!! This hot potato salad sounds fantastic! Hope you have a wonderful holiday Christin!! I haven’t had a hot potato salad in the longest time, Christin! I’m absolutely loving this version! And that bacon on top looks so good. Pinned! I just love hot potato salad especially if there’s bacon involved! This salad is absolutely gorgeous, Christin! I love hot potato salad. And the bacon on top is lovely! Give me a big helping, please!